My name is Xavier LeMond. I’m an IT professional who has been working with computers, networks and telecom for more than 25 years. My real-world experience includes extensive engagements in the financial, medical, entertainment and currently energy industries. From software design and development to systems infrastructure and security, a broad range of experiences have given me unique perspectives and shaped how I approach diverse issues. In my time, I’ve not only seen, but have been part of, a lot of dramatic changes with regard to computers, systems and technologies that have literally changed how we live and work several times over since I got my start. So I know a thing or two about upsetting the status quo. Now, I’m an Executive Coach. I assist CEOs in navigating technological disruption by helping them to widen their perspective, eliminate blind spots, and gain clarity so that they can turn problems into profits and company deficiencies into competitive advantages. 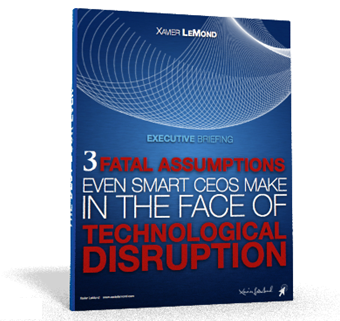 If you haven’t already, I invite you to download my exclusive executive briefing: “3 Fatal Assumptions Even Smart CEOs Make In The Face Of Technological Disruption” that concisely summarizes new industry concerns and reveals the single, most critical concept that you as a CEO cannot afford to miss in this age of technological, geopolitical and consumer empowered change. This report won’t take you more than 10 minutes to review, but it could provide you with a critical insight that will dramatically affect and alter how you lead your company. There’s no cost or obligation. You won’t even have to opt in to receive the report. Inside the report, you’ll also find an opportunity to claim a FREE, in-depth coaching session with me that will help you employ a bit of the “Disruption Alchemy” that I perform for my clients. I offer this because I’d like to prove to you how executive coaching is a powerful, purposeful, effective tool for dealing with business problems that you may not have experienced or even considered before. I know that if you find the coaching experience valuable, you might want to become a client. This FREE Coaching Session is NOT a “sales pitch in disguise.” My purpose is to address a challenge you are facing and to demonstrate first-hand the value of coaching for you instead of merely talking about it. …then seek me out today. Download your free copy of my exclusive Executive Briefing. Let’s work together to get your company on a fast track to thriving in your industry!